Have you seen this ribbon at Michael's craft stores? It's heck to find. Per Michael's, it's a ribbon that is exclusive for their stores and it's even MORE exclusive because it seems that my store never gets any! My new friend has been selling it to me if and when she finds it so I'm thinking that if any of you find it, I would love to purchase it from you. It is the Sweet Treat line by American Craft. 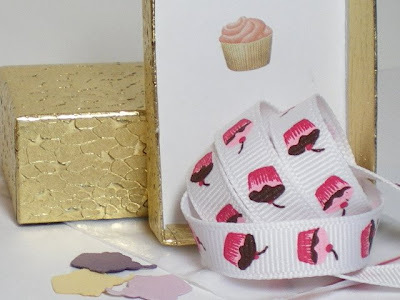 I'd love to have about 10 spools of this stuff for my ribbons on the boxes of cupcake jewelry I ship out. If you can help me I would be very appreciative and have other cupcake goodies I might even trade for it if you prefer to barter.